Have a free afternoon, or just a little time and want to read a quick book that will leave you feeling happy? 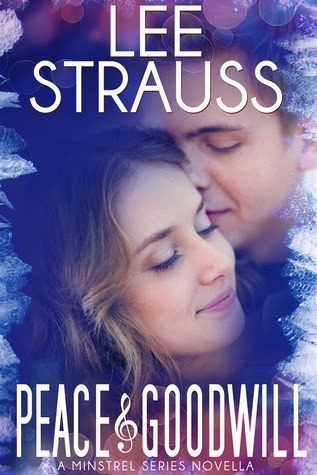 Then Peace and Good Will by Lee Strauss is a great choice. I received a copy of this novella to review. Peace & Goodwill is set in The Minstrel Series world, but can be read alone. Belle gets the best Christmas present ever, a man in uniform! Ian is a soldier home on leave. Neither of them have any idea how good it will feel to fall in love or how hard it will be to say good-bye. Anna is spending the holidays alone again with only her faithful dog Angel to keep her company. She can’t afford to pay the rent and her landlord is threatening to kick her out. At least she’s finished with her chemo treatments. She can be thankful for that. Plus, there’s Rhys, the handsome visitor with kind eyes. One fateful, cold and snowy night a chance encounter changes everything. Love is lost. Love is found. Life will never be the same. Peace And Goodwill, a Christmas novella in The Minstrel Series, grabs the heartstrings and pulls hard. This Christmas Novella is a very quick read that leaves you in the Christmas spirit and takes you on a roller coaster of emotions. Belle is a young women living on her own with no family, she is dreading spending another Christmas alone, but when a young solider home on leave comes into the book store she works at, things will never be the same. The book also tell's Anna's story, Anna is also all alone, dying of cancer with only her dog for a companion. She is trying to live in the moment enjoying her last days. One fateful cold day changes everything for her. I don't want to give any of this book away as there is a twist that I never saw coming, that is definitely worth the read to find out. This is a clean book, free of language and graphic imagery. I definitely want to read the rest of the series myself now, so I definitely recommend this. In the book, the main character writes and sings a song at one point, this song has been produced and the author is giving away a copy of the song to anyone who pre-orders the book. If you pre-order or order, just go to this google document and fill out the form so you can get you free song. With the launch of this new book the author is also doing a giveaway. Disclaimer: I was given a review copy in exchange for my honest opinion. Thank you for the feature and your kind review!